Is social media working well for you? Are you approaching it the right way? Everyone uses social media differently, and the approach you use should be based on your goals. In this article I’ll share three ways to use social media to get the results you want for your business. Find 3 ways to use social media for business. The instant nature of social media is ideal for sales. It’s no wonder social networks have become full-blown marketing channels. Those using a sales approach make no bones about the fact that they want you to buy their product or service. When you’re selling, your updates likely include discounts and coupons, limited-time deals, new releases and promotions. 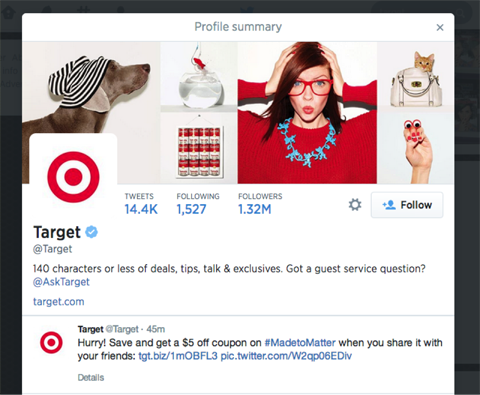 Target uses Twitter to offer discounts that lead to sales. Taking a sales approach is a straightforward and direct method of marketing—any users who convert know exactly what they’re getting into because they’re ready to buy. The downside of this approach is that when you drop the social component and go full-bore marketing, you’re defeating the purpose of social media. People don’t want to feel like they’re being sold to; they want to have a conversation, and ultimately, call the shots. As marketers, you can’t cut out selling completely—you have to find a balance. One popular way to structure the sales approach is known as the 70-20-10 rule. The 70-20-10 rule help balance your content. Balancing sales pitches with informative and relevant content is a good way to increase sales without being annoying. While the hard sell can be a turnoff if it’s overused, don’t be afraid to promote your product or service. Social media is a legitimate and expected form of marketing. If you don’t ask for and expect sales, you won’t profit from social media marketing. The most typical social media approach is positioning yourself as a resource. Content marketing professionals recognize social media channels as conduits and use them to pass information to fans, followers and customers. 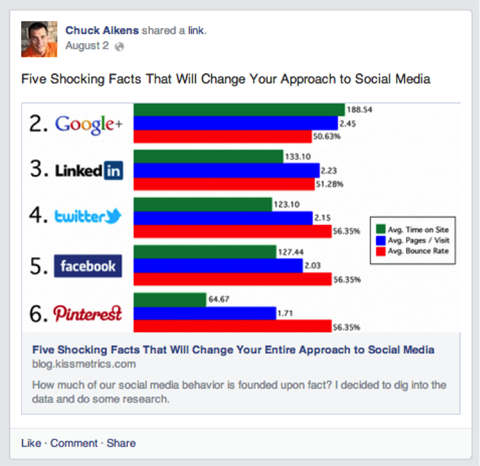 Chuck Aikens shares current and authoritative SEO advice on Facebook. If you’re using this tactic, your updates include tips, advice and links to interesting or industry-related articles and resources. Providing the information your audience craves translates into lots of follows, shares and positive word of mouth. Not only that, your social role as a trusted resource identifies you as a leader. People come to see you as someone who always has a great link to share and consistently gives out good information or advice. Share knowledge to become a trusted resource. Image: Shutterstock. When people view your social media feed as a resource, they’ll also view your own content as powerful and authoritative. This makes it much easier to share your own articles and views without coming on too strong. The biggest problem I’ve seen with this approach is boredom. If your social feeds are nothing more than links to articles, you become predictable. It takes quite a bit of time to find the best articles and resources to share. As Buffer staffers admitted, “We tend to read a lot of content at Buffer. And I mean a lot… We share 25 stories per day. We read even more that don’t make the cut.” Unleashing content at that rate is going to take some serious scouting time. Plus, if you work in a narrow niche, you may find yourself in the challenging situation of sharing great articles from your competition. On one hand, your competitor may be producing great content you can’t ignore. On the other hand, sharing that content may pose a strategic challenge if your goal is to promote your own service’s superiority. All companies want to give their customers the best experience possible, and right now that means providing customer service on social media. These days, many customers choose to bypass annoying phone menus and hold times in favor of a quick social media update (tweets are particularly popular). 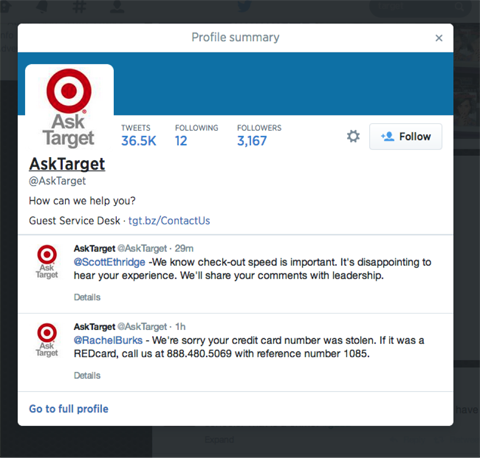 Understanding the need to meet their customers where they are, companies are monitoring Twitter in particular. If you’re providing customer service online, many of your interactions will include tips, tricks and hacks, information on how to use your product or service and solutions to complaints, obviously. With social media you have an opportunity to provide awesome customer service in mere minutes. That kind of immediate response tells people you have a strong commitment to customer satisfaction and a customer-centered presence. As you monitor mentions to keep up with customer service issues, you can also keep track of customer sentiment—you’ll see feedback on how your customers are doing and what they’re feeling. This is an opportunity to understand how people perceive your brand in the social environment. You can use that information to identify where and how to improve your service. If you’re using Twitter for customer service, your main account can be awfully boring when it’s nothing more than customer inquiries and responses. Your feed will be a painful waste of time for anyone not directly interested in those discussions. To avoid that, some companies set up separate accounts for the sole purpose of addressing customer service issues. Customers’ intense expectation of an immediate response can be exhausting. If you don’t have the staff to keep up with and respond quickly to customer service issues, you may find yourself in a bit of turmoil. This customer complaint received an automated response. Not exactly stellar customer service. If you can’t provide personal attention, you risk your reputation. 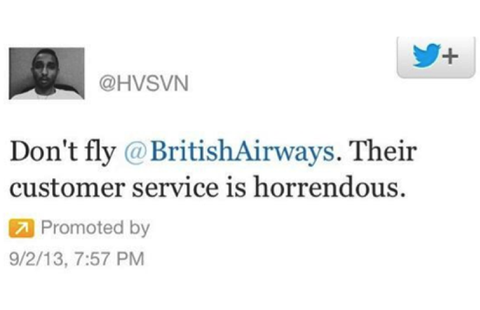 For example, Hasan Syad tweeted a complaint about British Airways’ customer service (and spent $1,000 to promote that tweet). Over 77,000 people saw it. The company’s response? “Twitter feed is open 0900-1700 GMT.” That’s not exactly the kind of customer service users expect from a multi–billion-dollar global brand. I’m not suggesting that you can or will only use one approach in your social media marketing—that simply wouldn’t work. As you’ve likely experienced, tactics are mix and match, and you combine them in a way that supports your current and long-term goals. What I’ve provided here is food for thought. Considering the pros and cons of popular social media approaches helps you decide which ones fit your current campaign (and in what capacity). The combination you choose can create a social feed that is interesting, helpful, intriguing and valuable. What do you think? 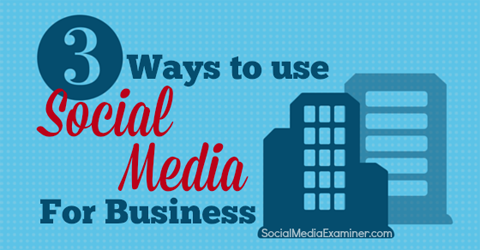 How do you use social media for business? Which of these approaches do you use? Does one work better than another for you? Please leave your comments below. Knowledge sharing on blue puzzle pieces background photo from Shutterstock.